1989, Hubcap used, 14", 65, BUICK, SPECIAL, HOLE TYPE WITH SPINNER. 1991, Hubcap used, 15", 65, BUICK, RIVIERA, 54 SLOT TYPE, WITH SPINNER. 1996, Hubcaps used 14", 66, BUICK, SPECIAL, SLOT TYPE, WITH SPINNER. 301, HUBCAP USED, 14", 66-67, Chrysler, 300, WITH SPINNER, EXCEPT 14-SLOT OR DOME TYPE..
301, HUBCAP USED, 14", 66-67, Chrysler, 300, WITH SPINNER, EXCEPT 14-SLOT OR DOME TYPE. 3257, Hubcap used, 15", 59-62, CHEVY, CORVETTE, 10 SLOT TYPE, WITH SPINNER. 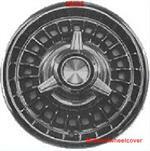 3258, Hubcap, 15", 63, CHEVY, CORVETTE, CHROME, 6 SPOKE, 6 SLOT TYPE, WITH SPINNER. 3259, Hubcap used, 15", 63, CHEVY, CORVETTE, SILVER, 6 SPOKE TYPE, WITH SPINNER. 3260, Hubcap used, 15", 64, CHEVY, CORVETTE, 9 SLOT TYPE, WITH SPINNER. 3271, Hubcap used, 15", 56-58, CHEVY, CORVETTE, 10 SPOKE TYPE WITH SPINNER.SPOKE TYPE WITH SPINNER. 3271, Hubcap used, 15", 56-58, CHEVY, CORVETTE, 10 SPOKE TYPE WITH SPINNER. 3280, Hubcap used, 13", 62-63, CHEVY, CHEVY II, WIRE TYPE, WITH SPINNER. 3965, Hubcap used, 15", 65, CHEVY, CORVETTE, 6 SLOT TYPE, WITH SPINNER. 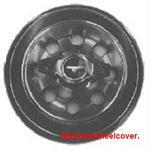 3973, Hubcap used, 15", '66, CHEVY, CORVETTE, 5 SLOT TYPE, SPINNER. 3973, Hubcap used, 15", 66, CHEVY, CORVETTE, 5 SLOT TYPE, WITH SPINNER. 567, Hubcap used, 14", 65, DODGE, CORONET, WITH SPINNER. 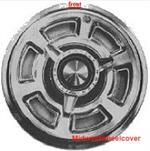 5996, Hubcap, 14", 66, PONTIAC, PASSENGER, 24 SLOT TYPE, WITH SPINNER. 606, Hubcap, 14", 65-67, MERCURY, COMET, COUGAR, WIRE TYPE WITH SPINNER. 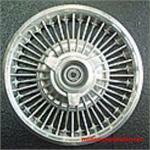 615, Hubcap used, 14", 67, FORD, FAIRLANE, FALCON, MUSTANG, WIRE TYPE, WITH SPINNER. 616, Hubcap used, 14", 65-67, FORD, FALCON, CHROME OUTER RING, WIRE TYPE, WITH 3 BAR SPINNER & LOGO IN CENTER, METAL CLIPS. 627, Hubcap, 15", 67, MERCURY, PASSENGER, EXCEPT WIRE TYPE, WITH SPINNER. 629, Hubcap used 14", 66-67, FORD, MUSTANG, WIRE TYPE, WITH SPINNER, EARLY. 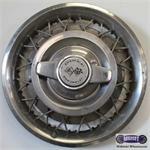 632, Hubcap used, 15", 67, FORD, THUNDERBIRD, CHROME OUTER RING, 24 SLOT TYPE, GRAY POCKETS, WITH SPINNER, BLUE CENTER & CHROME LOGO, BLACK ENGRAVED WORD THUNDERBIRD ON SPINNER, METAL CLIPS. 636, Hubcap, 14", 68, MERCURY, COMET, COUGAR, FIN TYPE, WITH SPINNER. 654, Hubcap used, 15", 68, FORD, THUNDERBIRD, 24 SLOT TYPE, WITH SPINNER. 962, Hubcap used, 15", 65, FORD, MUSTANG, SPINNER TYPE.